For most people involved, cosplay is a hobby, but for some it can be more. As the scene grows in popularity, so too do commercial opportunities for those involved. Especially if you like dressing up as characters from video games. There are plenty of ways to get paid for cosplay. Craftsmen and women have long been selling replica weapons and armour to fans. And the organisers of conventions, attracting tens of thousands (or sometimes hundreds of thousands) have been quick to capitalise on the popularity of individual cosplayers by helping promote (and pay for) their appearance at a show. One of the newest career paths for cosplayers, though, is also one of the most interesting: sponsored cosplay. This is where companies who are promoting an entertainment product pay a cosplayer to dress as a character from one of their properties. They may also pay that cosplayer to appear live at conventions and product launches. For the cosplayer involved, it’s no doubt an amazing situation to find yourself in. Here you are, doing something you love (that requires great sacrifices of time, effort and money), and you suddenly get the offer to keep doing what you love, only now you can get paid for it. It’s essentially turning their passion into a job, something most of us can only dream of. For the companies involved it’s an elegant marketing approach. A cosplayer who is super into your game will likely be far more enthusiastic and knowledgeable than a traditional “booth companion”, and their presence—all kitted out in professional gear like a video game character come to life—no doubt helps boost the atmosphere and hype of any event they’re attending. This professional scene is a brave new world inhabited by some of the world’s best cosplayers, who I spoke with to learn about their experiences being flown around the world and transformed into some of their favourite video game characters. Chiro, from Italy, has been working with video game companies for years, beginning with small collaborations with companies like Capcom and 2K before graduating in more recent years to extensive sponsorship roles with Sony and Ubisoft. While previously his work was quite casual, these days he generally signs a contract that guarantees him a rate of pay for the work he performs, along with all the costs required to attend a convention, from flights to hotels. He bills his sponsors for the cost of his costume, which he still makes himself. Like Chiro, Boer—made famous for his Assassin’s Creed and Metal Gear cosplay—has begun to increase the amount of sponsored work he does, to the point where he’s formed a company specifically to promote his services as a sponsored cosplayer. “Because it takes hundreds of hours to deliver the quality I strive for, full costumes can be very expensive and thus it’s mostly work for companies I do now”, he tells me. Most of these jobs involve attending gaming events, or shooting videos for marketing campaigns. “Event work means hanging around at the booth where the game was being promoted and taking pictures with people, ala Mickey Mouse in Disneyland, or standing in the background of interviews with staff and crew at the event”, Boer says. Because he’s been hired by companies like Ubisoft to work alongside the launch of big games like Assassin’s Creed, Boer enjoys some perks that hobbyist cosplayers can only dream of, like access to pre-launch 3D game assets to help him get his costumes 100% correct. Which sounds amazing, but can also bring with it its own set of challenges. “Of course the people that hire you have something to say about how you make a certain piece. I remember getting a color change through of a certain character right after I had already completed it. This meant going back and changing it.” He also has to meet strict and often short deadlines for his cosplay work, something that runs contrary to any cosplayer’s first instinct of working on something until they feel it’s perfect, regardless of the time involved. 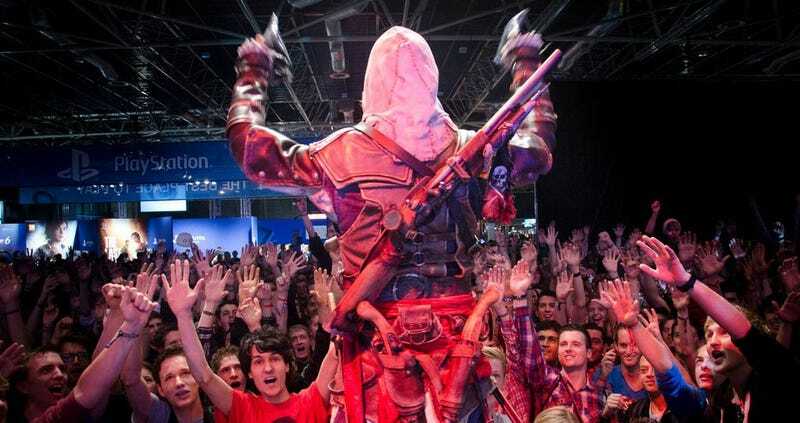 Boer at a Ubisoft Netherlands event. Photo by Tamara Robeer. Graziano made headlines in 2011 when she signed what was then an extraordinary deal with the publishers of the video game Firefall, whereby she’d be sponsored by them for an entire year. Not for specific events, or an ad or two, but for the entire year. In the years since she’s continued to do sponsored work, most recently for Clash of Kings and the Master of Orion reboot. Like Chiro and Boer, Graziano ensures that her work is always covered by a contract, but knows from others’ experience in the scene that not everyone is so smart (or lucky). When cosplay first emerged from the costuming and masquerade scene in the 1970s, it was the product of pure, untapped fandom. It’s where much of the joy and accessibility of the community draws its power. A lot of the appeal of cosplay isn’t just in seeing cool costumes, it’s in identifying with and sharing your love of a character or series with someone else. What was once just about fans and friends, though, is clearly changing as cosplay becomes more popular (and by extension more visible). Where once you’d find cosplayers dressing up solely for fun, here we are in 2016 talking about cosplayers from around the world being paid by massive corporations to essentially be living advertisements. For cosplayers, this sponsored work can be a chance to turn their hard work into a career. For fans, it’s a chance to not just see their idols—and yes, big cosplayers can have hundreds of thousands of fans—be able to create better gear, but also increase their chances of getting to see them in person at an event like PAX or GamesCom. And who knows, for the FTC, it may in the future be something to take a look at once they’re done policing disclosure notices in YouTube videos, since there’s the potential for line between entertainment and marketing to be blurred when it comes to cosplayers sharing their sponsored work on their private social media channels. For now, though, it’s just the latest example of the way cosplay is changing (and being changed by other forces) as it goes through a time of explosive exposure.